Knowing that Guatemalans start playing soccer at a very young age, our team was a little anxious about being challenged by the Los Verdes/La Communidad community to a soccer tournament Tuesday evening. We were anxious about getting beat 10-zip, but excited that these communities have something in common that overcomes their geographical boundaries and social differences. Excited and honored that they wanted to include us in this evening of fun. Given the daily dose of rain we’ve been experiencing this week, the tournament moved indoors to the local gimnasio. 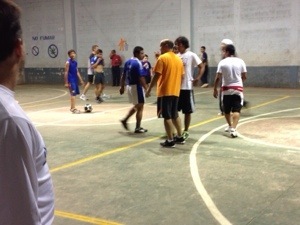 Playing with and against the local community was definitely a highlight. And for a brief time, it didn’t matter where you lived or what language you spoke…the crowd cheered for everyone! The tournament started early in the evening and we were told would last until 11:00 p.m. They are serious about their soccer tournaments here! It was obvious by 9:00 or so that we were completely out of the running (well maybe it was obvious much sooner than that), but we played as long as we could. It was wonderful seeing the kids from the Learning Center with their parents, and in some cases, playing on a team with their family members. All in all, we felt embraced and loved by this community with whom the feeling was mutual. 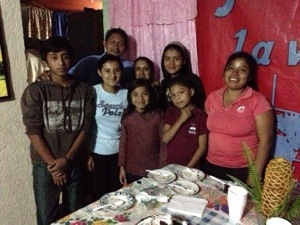 After the tournament a local pastor, Pastor Alfredo, invited our team to his house. He was so gracious to have us into his home, and we were humbled at his sharing of food and of his church planting efforts throughout Central and South America. He expressed his gratitude at how the Learning Center and our church support is affecting his community in such a positive way, but we were told that it is he who is there day in and day out also supporting the Center by driving his own van as a school bus. It would seem that the partnership between this community and our church community is a mutual blessing! How wonderful to see God at work in this place! It is such a blessing to see you at work on the mission/thank you for your service for JESUS. We do need to be more grateful for what we have been given.